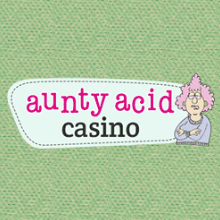 Aunty Acid is back, bringing her own warped sense of humour to the hallowed halls of the online casino. So, buckle up as it’s going to be a bumpy ride at Aunty Acid Casino and we at Boku Slots are here to guide you through safe and sound. 50% cash match bonus on 3rd deposit between £10 and £500, plus possible 350 bonus spins. Because of the details within this welcome bonus, we would recommend that you check out the promotions page. But as well as the cash match you can enjoy a number of bonus spins, depending on how much is deposited. For the minimum £10 you’ll receive 20 spins and for £200 and above the full 350 spins. The higher amounts are also broken down and allocated over a number of days, rather than you using them all up at once. Aunty Acid Casino doesn’t let its players down when it comes to gaming either. With a huge collection of slots, casino and instant win games, you will barely have time to take in the witty repartee that Aunty Acid is so well known for. But don’t worry, she isn’t too bothered as long as you are having fun. The slot’s section is crammed with fun games to get stuck into, including the frantic Fireworks Frenzy which is a firm favourite with us. The casino games are brilliant too with old favourites including roulette or blackjack, plus newcomers Slam Funk and Wild Champions. Now we all know that there are those of us out there who prefer the instant win. That thrilling feeling you get when you are scratching those sections to reveal the big win, cannot be described. Well don’t worry, Aunty Acid has you covered with her assortment of scratch card games. Old favourites like Kittenball and Go Bananas, sit side by side with games we haven’t seen before. To make things even more awesome than you thought they already were. Aunty Acid Casino is available on any mobile device. Yes, Aunty Acid, despite her age is mobile friendly, who knew? All you need is a smartphone, tablet or desktop (for those of you that are not as up to date tech wise) and you are ready to rock and roll. 100% casino cash when depositing £200 or more. 20% rewarded on deposits of £1000 or more. Aunty Acid Casino has a dedicated support team on hand to help with any depositing, withdrawal or wagering queries amongst other things. You can get in touch via email, by opening a ticket or by speaking to a live chat operator who is available 24/7. With all these rewards and bonuses flying around you are probably wanting to know how to go about getting those funds added to your account. Aunty Acid Casino accepts various methods of payments. This includes credit and debit cards, Skrill, PayPal and one of the easiest and increasingly popular options Boku, which is a pay by mobile phone bill. Well, if the sharp comebacks and sarcastic remarks from Aunty Acid, aren’t enough to attract you to get an account signed up. We’re sure that the exciting bonuses and rewards will have changed your mind. So head over to Aunty Acid Casino and grab those bonus spins.